After a plane crash strands an oil drilling team in the middle of the Alaskan wilderness, the group must try to survive against not only the freezing temperatures and harsh elements, but a pack of wolves whose hunting territory they've invaded. "The Grey" is not the movie I expected, it is better. Going in I thought the audience was simply getting Liam Neeson fighting wolves. A survival action with Neeson taking down some Alaskan wolf pack one by bloody one. I pictured director Joe Carnahan behind the camera revving up the action and going for the throat with edge of your seat thrills for ninety plus minutes. By every stretch of the imagination, I was absolutely content paying to see exactly that, but director Joe Carnahan wanted to make something that digs a little bit deeper than just your typical survival action. He wanted to peer into our psyche, our passions, our memories, our resolve, and our determinations. 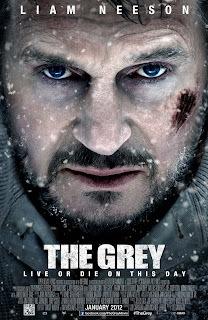 Director Joe Carnahan definitely went for the throat with thrills and action throughout "The Grey" but he also goes for the heart with patient characterization and tragically raw human emotions. As you'd expect, Liam Neeson is riveting to watch. Neeson is one of those actors that has always carried himself in such a manner that you are automatically drawn to him, and here is no different. When he speaks, you are at attention and when he says to do something, you do it. Neeson's character Ottway, easily gravitates as the person to follow after the crash landing for the group of survivors. They latch on to his survival skills and from an audiences perspective, there's no questioning their decisions because of Neeson's persona, which seems to continually drip natural born leader and a bona fide badass. Ottway doesn't just lead in the way of survival tactics either, he models behavior the other survivors (and audience) admires and connects with. One prime example of this comes in the second act while the group are huddled around a fire and Ottway expresses his fear of survival. Neeson has you hanging on every word during this dire monologue and you feel the depth of Ottway's emotions as Neeson puts them out there for all to hear. Lastly, it was a nice touch to have Neeson speaking in his native accent. It is just another piece to the puzzle that makes Neeson such a distinguishable actor. 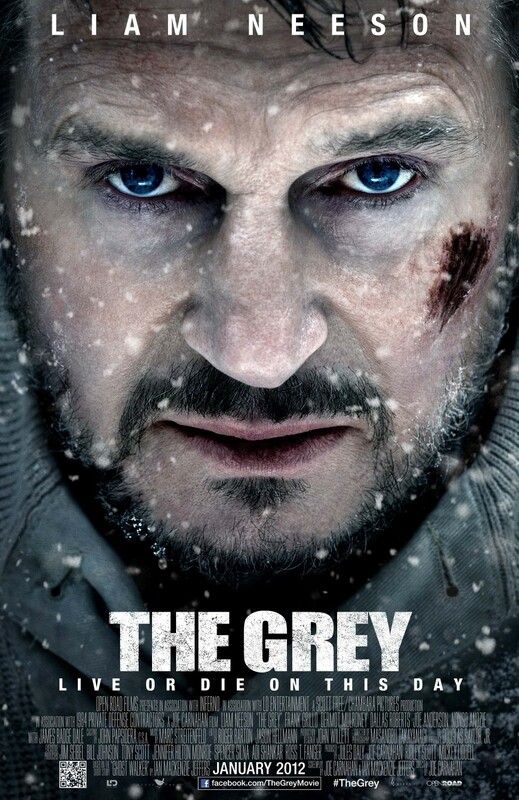 There is an unexpected patience Joe Carnahan displayed in "The Grey" that ended up propelling this movie from being a good action to an all around great film. One big reason is the amount of attention spent on characterization of the survivors. Carnahan's script allowed for each and every survivor to have something that the audience could connect with. These are real human characters on screen that are facing an extremely dangerous environment and dying. They are coping with tremendous fear and "The Grey" boldly slows down and allows for authentic moments and feelings to come out on screen. Carnahan also gives each of the survivors fitting deaths, he takes us through their pain and suffering before the release. He builds a bit of discomfort and uncertainty within the audience and balances it with stunning moments of serenity. Let's talk about the wolves for a moment, actually wait, allow me to stop and applaud Joe Carnahan for not just making totally cgi wolves. Too many movies have actors running from a tennis ball on a stick imagining it will be a monster or wolf in the finished product, but here Carnahan went out of his way to make sure they utilized something that looked real. Something the actors could work with and see on set. The result is apparent on screen and there is a nice balance of real wolves, animatronics, and cgi enhancements that combined to make the wolves incredibly ferocious and undeniably frightening. One sequence I found absolutely chilling doesn't even feature physical wolves that the audience can see, but instead only their breath as they howl into the black Alaskan night. The suspense of the wolves throughout "The Grey" is without error. Any notion that a member of the pack is near is matched with instant tension that is palpable just as if the audience was watching a slasher horror film. From the growling, snarling, and/or howling to the panting breath as the pack would chase closer, each moment with a wolf on screen is met with white knuckle panic. The wolves aren't the only thrills director Joe Carnahan provides either. Much of the sequences of the group battling the elements are equally thrilling. Seeing as the snow builds up on men's faces, as they sink deeper and deeper with each step forward, or as they struggle to maintain the fire against the seventy mile an hour winds. The endurance and resolve these characters/actors exhibit is both compelling and vivid. These men are facing their fears in the Alaskan wilderness and Carnahan along with cinematographer Masanobu Takayanagi really put the audience in the perspective of the characters. This tactic is used most of the time with the attack sequences but also in a few scenes where the survivors face their fears. One fear in particular being heights and the first person point of view Takayanagi uses with his camera takes the audience right over the edge into a truly daunting experience. Some attention must also be payed to the intimidating crash sequence. Much of the crash focuses on Neeson's character Ottway, as the plane goes down. I loved the balance Carnahan again displayed throughout this sequence. Half unnerving, half soothing and the result of those two halves is totally spine-chilling. "The Grey" is a tremendous start to 2012. It is a survival horror and a drama that will stand the testament of time. It houses rich characters and heavy hitting thrills that you will want to experience again and again. Ultimately it is a film that will leave you thinking and talking about it, but also telling friends to see it immediately.